Dayne has created a sweet collection of this hot new fashion accessory. All of them are created with size 4 (worsted weight) yarn. There are a total of 10 projects, and all are rated as “easy”. All but one of the patterns is sized for both girls and teens. All instructions are written, without charts. The projects are created from a variety of stitch patterns, with different stylized flower embellishments. There is a super cute fascinator-type headwrap that any girl, grown-ups included, would like. In fact, I might have to make one for myself. These patterns would make great beginner projects, though this booklet is primarily a pattern booklet, only having a small section in the back of general instructions. Once a beginner knows the basics, however, any of these patterns would be achievable. Whether created for a little girl, or a big girl, these would make not only great fashion accessories, but included in a “spa” package with a crocheted spa cloth and a lovely bottle of bath gel, would make a fabulous gift for special friends. Full disclosure: A free review copy of Headwraps was provided by Leisure Arts. Although I accept free products for review, I do not accept additional compensation, nor do I guarantee a positive review. My reviews are based entirely on my honest opinions. 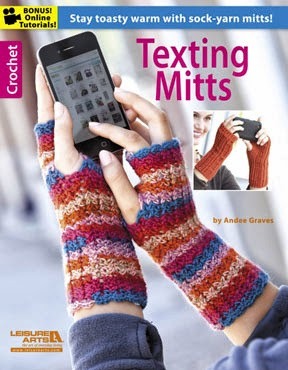 Andee Graves has been designing for some time now, but this is her debut book title, Texting Mitts. All of the projects are fingerless gloves that are created from sock weight yarn that will appeal to young and young-at-heart alike. There are a total of eight projects, in a variety of skill levels and a variety of techniques, from lace to very textured stitch patterns. Like many of the current Leisure Arts titles, there is an online link to step-by-step tutorials, for both left- and right-handed crocheters for each project. Ms. Graves has created a winner, with a nice variety of mitts that will keep your hands toasty warm and still allow you to use your wireless device. Any of these patterns would also make lovely bridal or prom accessories, as well as stage or re-enactment props, making them truly timeless. In fact, I have a stash of sock yarn that I may have to use to make a few pairs of these for gifts. I look forward to seeing what Graves creates next! Full disclosure: A free review copy of Texting Mitts was provided by Leisure Arts. Although I accept free products for review, I do not accept additional compensation, nor do I guarantee a positive review. My reviews are based entirely on my honest opinions. Crochet Cool by Tanya Bernard (also known as Tanyastangles on Etsy) is a crochet pattern book featuring 21 clothing and accessory designs for toddlers and pre-schoolers. The patterns are arranged into four seasonal sections. Because Tanya lives in Florida, the winter designs are probably a bit light for those of us living in snowy parts of the country, but she does represent each season with fashionable yet classic projects. The designs include items for both boys and girls, and Tanya uses a variety of fibers. Each pattern includes several largely, brightly lit photographs of the design on a child model – typically from several different angles – as well as a brief description, a difficulty rating (measured by yarn balls), and a key to the abbreviations used in the pattern. All patterns are written with US pattern abbreviations, and many include photo tutorials of unusual stitches or construction techniques. Tanya’s patterns include fun details, such as surf board appliqués, many of which can be used to adorn other projects. The book doesn’t include any international stitch symbols. Because it is a paperback, it doesn’t lay flat so you can’t read and crochet at the same time. Like many designers who are primarily self-published, Tanya uses a pattern writing style that is different than what you might see in crochet magazines, but her patterns are clear and understandable. Crochet Cool assumes that readers already know the basics of crochet, so don’t expect to find general crochet technique information inside. 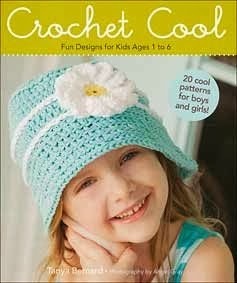 I would recommend this book to advanced beginner and intermediate crocheters who enjoy making children’s items. If you are new to children’s garments, this book is definitely a great introduction. Some of my favorite patterns are the Daisy Dress, the Laced Up Tanktini, the Garden Jacket, the Granny Square Winter Coat, and the Skater Sweater. Connect the Shapes Crochet Motifs: Creative Techniques for Joining Motifs of All Shapes by Edie Eckman is the follow up to her bestselling book, Beyond the Square Crochet Motifs. The book was a pleasant surprise for me. I expected a short book with suggestions for interesting ways to join crochet motifs, and what I found was a collection of over 100 crochet motif patterns along with many tips and tricks for making more polished motifs and joins. The first part of the book, Techniques, is filled with ideas for starting to crochet in the round, reading symbol patterns, starting and ending rounds, weaving in ends, color theory, choosing yarn, planning increases, arranging shapes, mutliple methods for joining motifs (in progress and while they are finished), forming continuous motifs, and blocking. While some of this information is also available in Beyond the Square Crochet Motifs, if you love crocheting motifs and are always looking for ways to make your projects look even better, this section will help take your motif crocheting to the next level. The next part of the book, Motifs and Joins, includes both motif patterns and suggestions for joins. Each pattern is written with both U.S. pattern abbreviations and international stitch symbols. The patterns are organized into different sections based on construction and appearance. My favorite patterns are in the Layered Mesh, Start with a Flower, and Swirls sections. The third part of the book, Patterns, includes 12 projects. All but one of these projects includes new motif designs. The projects include 9 home decor projects and 3 women’s garments (1 shawl, 1 vest, and 1 skirt). The Lacy Skirt is my favorite of these projects and would be a great wardrobe staple. The book ends with a motif directory which includes a thumbnail of each motif in the second section so it will be easy for you to locate your favorite patterns. The book is a spiral-bound hardcover, so it stays open while you crochet. Overall, this is a great book for crocheters who like to make motif patterns and other portable projects. There are tips sprinkled throughout, and while the joins work with specific motif patterns from the book, a careful reader could learn a lot about adapting joins to different motif patterns. I would also recommend it to crocheters who prefer international stitch symbols, as well as beginners hoping to advance their technical skills. 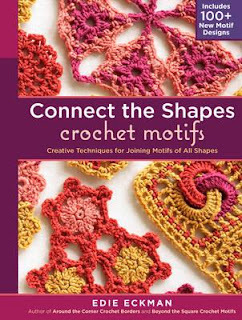 Full disclosure: A free review copy of Connect the Shapes Crochet Motoifs was provided by Storey Publishing. Although I accept free products for review, I do not accept additional compensation, nor do I guarantee a positive review. My reviews are based entirely on my honest opinions. 50 Fabulous Crochet Bobbles, Popcorns and Puffs by the late Jean Leinhauser of the Creative Partners is a pattern booklet featuring 55 textured stitch patterns. Each pattern includes a large swatch photograph and clear written instructions using US pattern abbreviations. The book begins with a table of contents featuring thumbnails of each stitch, so it is easy to find patterns again. As a booklet, it can lay flat, making it easy to crochet and read at the same time. The booklet is also lightweight enough to be portable. The booklet doesn’t include any international stitch symbols. While there is diversity in the density of the different stitches – which create lacy to heavy weight fabrics – the patterns all emphasize dimensional/textured stitches and don’t include a variety of other stitch types. There are no difficulty levels indicated, and the book assumes you already have basic to intermediate crochet skills. I would recommend this booklet to crocheters who are beginning to explore stitch guides, crocheters who enjoy using textured stitches, and those who are budding designers. A stitch guide collector will probably find that several of the stitches are already represented in their other books. 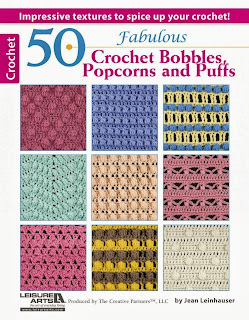 Full disclosure: A free review copy of 50 Fabulous Crochet Bobbles, Popcorns and Puffs was provided by Leisure Arts. Although I accept free products for review, I do not accept additional compensation, nor do I guarantee a positive review. My reviews are based entirely on my honest opinions. Baby Crochet: 20 Hand-Crocheted Designs for Babies Newborn-24 Months by Sandy Powers is a colorful book filled with cute projects for newborns and toddlers. Sandy, a well-established Etsy seller of crochet patterns, brings together fun projects with great photography and layout in this book. Baby Crochet assumes you already know the basic stitches and it dives right into the patterns, which are organized into four sections: Hats, Body Suits, Cocoons, Afghans, and Other Crochet Bits. Like many designers who are primarily self-published, Sandy has her own style of writing patterns (using U.S. crochet terminology) which is slightly different from what you might be familiar with from magazines. Her style is clear and consistent, though, and she also includes detailed progress photos for stitches or techniques (like post stitches, surface crochet, and adding fringe) that may be more challenging for a beginner. The book features over 150 brightly colored photographs, including progress photos and several pictures of each design on doll models and/or children. Sandy notes in the beginning that “The saying ‘never work with children or animals’ is so true,” but Tara Renaud’s adorable photographs would lead you to believe that all went well on the set. The patterns do not include a difficulty rating, but most of the projects use methods within reach of an advanced beginner. 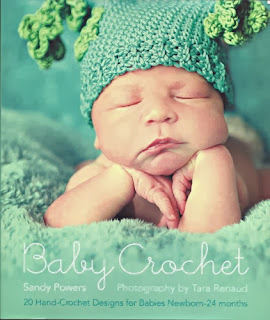 More experienced crocheters who are looking for ideas for baby projects may also like this book. Most of the patterns are only available in one size, but a few have directions for multiple sizes. This book would appeal to beginner crocheters looking for small projects to make when trying out new techniques, as well as more experienced crocheters who make a lot of baby gifts and charity projects. The book is really bright and fun to look at, and will definitely encourage you to pick up your hook and get stitching. Project types: 9 hats, 4 cocoons, 3 diaper covers, 2 blankets, 2 booties, and 1 each bunting, onesie, cardigan, and legwarmers patterns. Full disclosure: A free review copy of Baby Crochet was provided by Sellers Publishing. Although I accept free products for review, I do not accept additional compensation, nor do I guarantee a positive review. My reviews are based entirely on my honest opinions. Here's a link to download the pdf of the 2013 Fall Fashion Show entry form. It's too late to snail mail your form. At this point, you must either e-mail or fax the completed form as instructed. Remember to print a copy and include that sheet with your garment when dropping it off at the conference registration desk by 4 pm, Friday, 4 October. See you there! With two weeks to go before the CGOA Fall Conference in Charlotte/Concord, NC, a certain rite of passage is already underway in households across the country. It's the Crochet Event Marathon; the late nights, missed meals, exasperated family and friends, aching fingers, and squinty eyes that result from our last minute efforts to crochet something to wear or show off at the conference. I am a participant in the marathon nearly every year and if there's one thing I've learned it's that for all the agony there is a great deal of ecstasy. 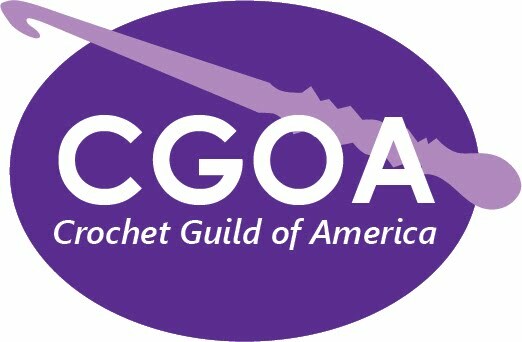 If you've crocheted (or are in the agonizing midst of crocheting this very minute) something amazing to wear and you are planning to attend the CGOA dinner on Friday, October 4th, please consider entering your creation in the CGOA Fashion Show which is always the highlight of the evening. This is your invitation to show me your stuff. Contrary to what you might think, the Fashion Show is not only for professional designs and corporate-sponsored entries; the show is put on by members for members. We don't aim to be slick and over-produced. We don't hire professional models. Yes, we parade some garments that appear in current crochet magazines, or designs for which patterns are available for purchase. That way we get to see some really cool stuff, much of it designed by CGOA members. But please know that everyone is welcome to join us on the runway. If you have a garment or accessory that you'd like to show and share amongst a crowd of friendly faces (perhaps rowdy, but really friendly!) come on up! Your entry does not have to be your own design. If you crocheted it and you're proud of it, then you belong with us. Please complete and submit a Fall Fashion Show entry form. This helps me plan the event. Print a copy of the completed form; you will need this to accompany your garment on site. If you're just deciding now that you want to enter so you didn't get a form with your attendee package, check back early next week and I'll have a link to the form. Turn in your garment with the printed form at the event registration desk any time before 4 pm on Friday, October 4th. At that time I will be gathering everything and prepping the script, deciding the running order and assigning models for the stuff that requires bodies. Come to the backstage area immediately following the dinner; there will be an announcement that it's time. Wear to the dinner that evening (or bring to the backstage area) clothes that will be a neutral palette for whatever might be needed. You don't have to be totally dressy or tricked out, but please, no jeans and flip-flops. Basic black is always appropriate, but any solid or otherwise neutral shade will be fine. As long as you feel good, you're good. Be extra considerate when handling other people's stuff. Avoid heavy make-up and perfume that night, which can transfer during changes. Take off any jewelry that could catch on crocheted pieces or clash with the designs. Follow the instructions of the backstage crew: me (the control freak barking orders and obsessing over details), Vashti Braha, backstage manager, and Diane Moyer, model wrangler and dresser. The latter two are goddesses and should be revered. Don't mind the confusion and giggling and other people's underwear! Have fun.... and remember to smile! Hope I haven't scared off any potential victims... uh... volunteers. See you there! Enter the Professional Development Committee's GIVEAWAY CONTEST! Giveaways are a lot of fun and this one is no exception! CGOA's Professional Development Committee is excited to tell you about a fabulous free giveaway sponsored by Lion Brand yarn. 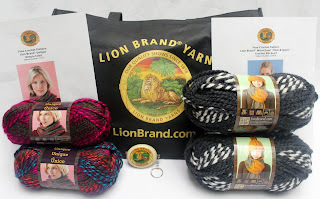 2 skeins of one of Lion Brand's newest releases, Unique. Unique is a bulky, self-striping yarn, where each ply is printed in a multicolor pattern so that the yarn creates a bold tweed effect as it is knitted or crocheted. 2 skeins of Wool-Ease Thick & Quick in new self-striping colors. Each colorway includes solid blocks of color with striped sections; these new colors allow you to create fast-finish team spirit projects without changing colors. Printed patterns to make a project with Unique and to make a project with Wool-Ease Thick & Quick. Lion Brand is the proud sponsor of Professional Development Day which will held in Concord, NC on October 2. You can find all the details herehttp://www.knitandcrochetshow.com/ and we hope you will join us! To enter, simply comment on this blog post. If you've attended Professional Development Day in the past, tell us what is your favorite part about it! If you've never been, tell us why you would love to attend. You can also earn a second entry by visiting and "liking" the CGOA Professional Development Facebook page. Contest will be managed by the Rafflecopter app on the CGOA Professional Development Facebookpage. Winner will be selected by random drawing by Rafflecopter. Contest ends September 27, 2013, at midnight EDT. Winner will be announced on the CGOA Professional Development Facebook page. Winner must provide a valid email address to the CGOA Professional Development Facebook page via a Direct Message to the page by midnight EDT on October 11, 2013. If a message is not received by that time, the prize package will be forfeit and another winner will be selected. It’s great to see so many familiar names and repeat entries among this year’s designers along with many brave first-timers. With every design package that arrives I am more and more in awe of the depth of talent and crochet creativity of our membership. Brava, each and every one of you! It is not too late to package up your entry and claim a piece of the $5,000 in prize money. In case you are planning to enter and are worried (procrastinating) about the shipping, considering the holiday and short time left, please breathe easy. Do not DO NOT pay for express/overnight shipping or go to extreme measures to meet the deadline. Just send me an e-mail at the information address on the form and tell me your intentions. We good.